A (3/3): Average white foamy head, fizzy and lasting. The beer itself is a very clear copper color. S (8/12): The aroma is very pleasant its lightly toasted malt profile with a bold Tropical fruit, mango and pineapple. T (16/20): The malt aroma is rich and sweet provided by Cara-Red, Crystal and Flaked Barley. The hops make this beer smells like a Tommy Bahama shirt looks. Juicy pineapple, mango and other tropical fruits care of the Galena, Millennium Ahtanum, El Dorado and Mosaic Hops. M (3/5): A medium mouthfeel, creamy texture, and soft carbonation . The beer finishes smooth with a light alcohol character. O (8/10): Very drinkable, hoppy and malty with a smooth finish. I really liked the logo. The undead "Rock Hand" coming out of the ground with the dawn of the dead logo. 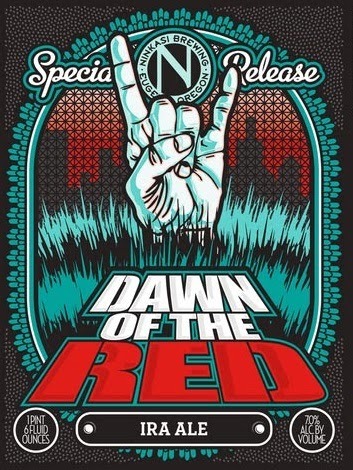 Ninkasi always has had pretty creative labels and this one is no exception. A nice balance of hops and malts with lots of loading on both sides.